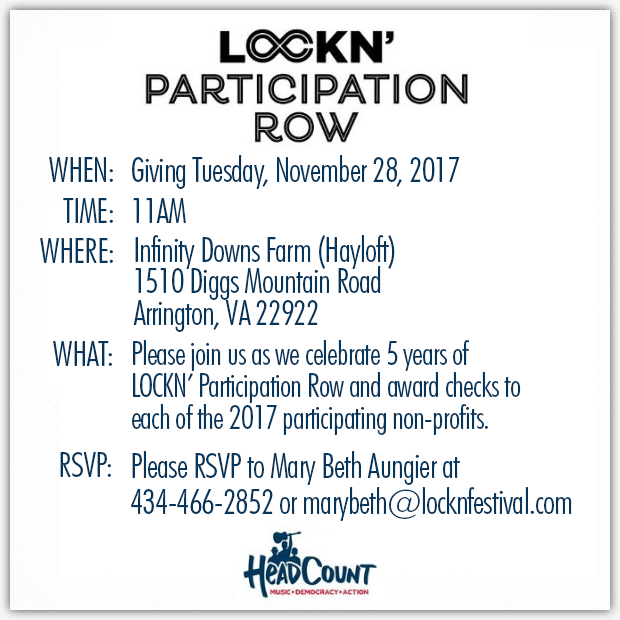 NOVEMBER 28, 2017 – ARRINGTON, VA – A five-year old tradition of supporting local and national charities will be celebrated at Infiniti Downs on “Giving Tuesday,” when the organizers of the LOCKN’ festival will present checks totalling $37,210 to 17 non-profit organizations where were part of the festival’s PARTICIPATION ROW social action village. HEADCOUNT that promotes civic and community participation through live music events. Since its debut, Participation Row has raised over $190,000 for LOCKN’s selected charities, and spurred LOCKN’ patrons to take over 30,000 socially-conscious actions. Following its success at LOCKN’, HeadCount expanded the initiative to other festivals and concert tours, including the Grateful Dead’s 50th Anniversary reunion concerts in 2015 and subsequent tours by Dead & Company In all, more than $1.4 million has been raised for charities through Participation Row, and nearly 100,000 actions have been taken. 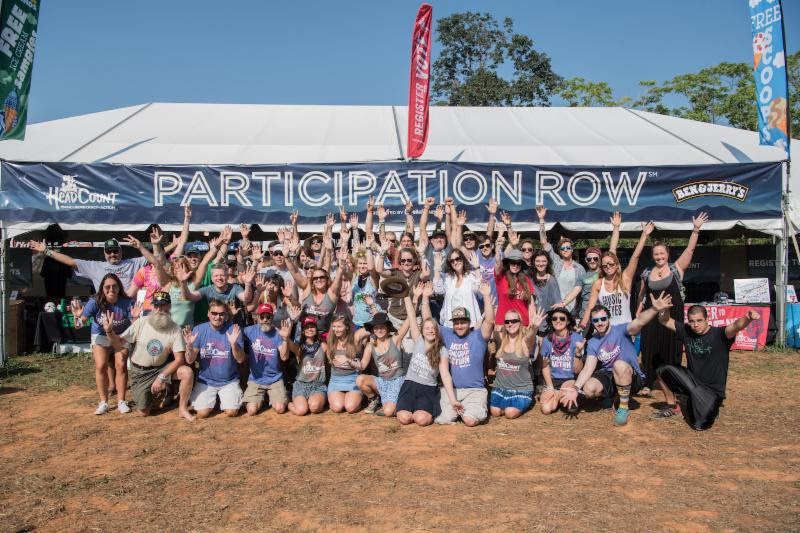 At LOCKN’, Participation Row has hosted or supported a total of 37 different organizations. This year, 17 charities participated, nine of whom are Virginia-based or represented by local chapters. Each will receive a minimum of $1,122.70. The organizations also benefited from the opportunity to engage directly with festival attendees. Fans visiting Participation Row are prompted to take simple actions to support each cause. Anyone who takes four actions is then entered into a free drawing for a D’ANGELICO guitar signed by the LOCKN’ headliners, and receive other treats like a free scoop of BEN & JERRY’S ice cream or a trial subscription to the streaming service QELLO. This year, LOCKN’ attendees took at least 8,924 of these actions. The fundraising component comes from a variety of sources including memorabilia auctions that HeadCount organizes at each event. This year’s auction featured a D’Angelico guitar signed by approximately two dozen LOCKN’ performers including Phil Lesh, Bob Weir, Brandi Carlile, Warren Haynes, members of Widespread Panic, Umphrey’s McGee and The String Cheese Incident It fetched $15,000.. Fans donated another $20,000 to the Heal Charlottesville Fund, a project of the Charlottesville Area Community Foundation, via a text-to-donate program featured on the festival’s free webcast. Klean Kanteen donated an additional $5,500 to Participation Row charities through sales of LOCKN’-branded, environmentally-friendly water bottles. Plus, LOCKN’ attendees donated over 4,000 pounds of food to Nelson County Food Pantry, via a Participation Row food drive staged by Conscious Alliance. The Pantry also receives a share of the auction proceeds. Other 2017 beneficiaries include Virginia-based organizations Lynchburg Humane Society, Wintergreen Adaptive Sports, North Branch School, Wild Virginia, Park School, Crozet Tunnel Foundation, RecycleLife, and the Virginia Industrial Hemp Coalition. United Plant Savers, Factory Farming Awareness Coalition, Giving Hope Foundation, Moms Clean Air Force, Love Hope Strength, and HeadCount also will receive donations. 2018 LOCKN’ LUMNI Weekend Passes (8/24-26) and Festival Passes (8/23-26) go on sale on November 24th. Artists will be announced in early 2018. For regular updates and more, please visit www.locknfestival.com. LOCKN’ is excited to announce that Dead & Company will be making a rare festival appearance by headlining the 2018 event. More artists will be announced one at a time daily via the festival’s social media beginning tomorrow, February 2 until February 8, when the full lineup will be disclosed in its entirety. LOCKN’ is set to take place in Arrington, VA, August 23 – 26, at Infinity Downs, LOCKN’s 387-acre property located at the foot of the Blue Ridge Mountains. Dead & Company — Mickey Hart, Bill Kreutzmann, John Mayer and Bob Weir, with Oteil Burbridge and Jeff Chimenti — will perform four sets of music over two nights, drawing from the Dead’s historic catalog of songs. Though most of its members have appeared multiple times at the festival in various unique iterations, this marks the first time Dead & Company has performed at LOCKN’ in its six year history. Tier 1 tickets for LOCKN’ 2018 go on sale Friday February 9 at 12pm ET exclusively via locknfestival.com. This year the festival will be offering a Three-Day Weekend Pass in addition to its traditional Four-Day Festival Pass. This new Three-Day Weekend Pass will allow those with tighter schedules to still see all the bands performing at Lockn’ for a lower price. The Festival will be running a VIP Pass contest on Facebook from February 5 – 7, that will give fans the chance to win a pair of Four-Day VIP Festival Passes. The VIP Pass offers access to VIP campgrounds, comfort stations with running water, showers, the air-conditioned VIP lounge, the Welcome BBQ, the Sunday Brunch, a private bar, complimentary late-night snacks, free water and soft drinks, a limited edition signed screen-printed festival poster, a limited edition water bottle, and access to VIP viewing platform and front of house viewing area. For more information on the VIP Pass, please visit: www.cidentertainment.com/events/lockn-2018. Last year, LOCKN’ was applauded for its massive site upgrade as it took its famous Blue Ridge Bowl and expanded it for the first time to a newly centralized venue encompassing both the main stage and the Bowl’s amphitheatre, allowing the more than 20,000 fans to enjoy non-stop music all weekend long with improved sight lines and easy access to all the incredible food, drinks, shopping, and social action activities LOCKN’ veterans have come to expect. The new and improved venue was more accessible to all camping sites, with additional shade and misting stations that provided extra respite from the summer heat and traffic routes were more direct and efficient as it made entering and exiting the festival smoother than ever before. For complete details, ticket availability and more, please visit www.locknfestival.com. About LOCKN’: LOCKN’ Music Festival was created in 2013 and takes place annually at Infinity Downs Farm and Oak Ridge Farm in Arrington, VA, at the foot of the Blue Ridge, in Central Virginia, 35 miles south of Charlottesville, and approximately 100 miles from both Washington, DC and Richmond, VA. With exceptionally creative programming, non-stop music and an incomparable celebration of everything the region has to offer from food to beverage to the stunning beauty of its location, LOCKN’ is one of the most revered modern American festivals. Since its inception, LOCKN’ has featured Tom Petty & The Heartbreakers, Phish, The Avett Brothers, My Morning Jacket, Robert Plant, Carlos Santana, The Allman Brothers Band, Willie Nelson, John Fogerty, Wilco and many more. LOCKN’ has officially confirmed its initial lineup and schedule for 2018. While many festivals have altered programming to suit their bottom line, LOCKN’ proved itself true to its core fanbase with a week of well-received, crowd-pleasing artist reveals. Headlined by Dead & Company in a rare festival appearance, performing four sets over two nights, the four-day camping event will also feature: Widespread Panic, Tedeschi Trucks Band performing two separate days), Sheryl Crow, Joe Russo’s Almost Dead performing on two separate days, George Clinton & P-Funk, Umphrey’s McGee (performing two separate days), Lettuce, Toots & The Maytals, Pigeons Playing Pingpong, Blues Traveler, Moon Taxi, Lukas Nelson & The Promise Of The Real, Turkuaz, The Suffers and more. The full schedule is below. LOCKN’ is set to take place in Arrington, VA, August 23 – 26, at Infinity Downs, LOCKN’s 387-acre property located at the foot of the Blue Ridge Mountains. A limited amount of LOCKN’ 2018 Nice Price Tickets for go on sale tomorrow, February 9 at 12pm ETexclusively via locknfestival.com. The allotment is currently LOCKN’s lowest priced ticket. They will sell out quickly and prices will then roll into Advance Tickets. This year, the festival will be offering a Three-Day Weekend Pass in addition to its traditional Four-Day Festival Pass. This new Three-Day Weekend Pass will allow those with tighter schedules to still see all the bands performing at LOCKN’ for a lower price. Last year, LOCKN’ was applauded for its massive site upgrade as it took its famous Blue Ridge Bowl and expanded it for the first time to a newly centralized venue encompassing both the main stage and the Bowl’s amphitheater, allowing the more than 20,000 fans to enjoy non-stop music all weekend long with improved sight lines and easy access to all the incredible food, drinks, shopping, and social action activities LOCKN’ veterans have come to expect. The new and improved venue was more accessible to all camping sites, with additional shade and misting stations that provided extra respite from the summer heat and traffic routes were more direct and efficient as it made entering and exiting the festival smoother than ever before. (ARRINGTON, VA) – The road to LOCKN’ 2018 for local Virginia bands is heating up as the Rockn’ to Lockn’ voting ends this Friday, February 16. Presented in partnership with Sonicbids and the Virginia Tourism Corporation, Virginia-based acts have been invited to take part in an epic battle of the bands, with three finalists ultimately selected to perform at this year’s LOCKN’, taking place August 23 – 26, 2018 on Infinity Downs Farms at the foot of the beautiful Blue Ridge Mountains in Arrington, Virginia. Twenty ROCKN’ TO LOCKN’ finalists will be announced on Monday, February 19; the leading 12 artists then move on to the Quarter Finals, with in-club performances and in-person fan voting slated for Friday, March 2at Shaka’s Live (2014 Atlantic Ave, Virginia Beach, VA 23451), Friday, March 9 at Harvester Performance Center (450 Franklin St, Rocky Mount, VA 24151), and Friday, Match 16 at The Jefferson Theater (110 E Main St, Charlottesville, VA 22902). From there, the top six bands will perform at the ROCKN TO LOCKN’ 420 Finals, slated for Friday, April 20 and Saturday, April 21 at LOCKN’ Festival’s beloved Garcia’s Forest on Infinity Downs Farms. The three winning bands will each win a spot to play live at LOCKN’ 2018 and receive a $500 performance fee. Rockfish Music is partnering with LOCKN’ and will produce and release singles of the ROCKN’ TO LOCKN’ winners. LOCKN’ has officially confirmed its initial lineup and schedule for 2018. While many festivals have altered programming to suit their bottom line, LOCKN’ proved itself true to its core fanbase with a week of well-received, crowd-pleasing artist reveals. Headlined by Dead & Company in a rare festival appearance, performing four sets over two nights, the four-day camping event will also feature: Widespread Panic, Tedeschi Trucks Band performing two separate days), Sheryl Crow, Joe Russo’s Almost Dead performing on two separate days, George Clinton & P-Funk, Umphrey’s McGee (performing two separate days), Lettuce, Toots & The Maytals, Pigeons Playing Pingpong, Blues Traveler, Moon Taxi, Lukas Nelson & The Promise Of The Real, Turkuaz, The Suffers and more. Tickets for Lockn’ 2018 are on sale now and can be purchased exclusively via locknfestival.com. This year, the festival is offering a Three-Day Weekend Pass in addition to its traditional Four-Day Festival Pass. This new Three-Day Weekend Pass allows those with tighter schedules to still see all the bands performing at LOCKN’ for a lower price. For regular updates and more, please visit www.locknfestival.com. LOCKN’ has long been hailed for presenting extraordinary artist collaborations and this year’s hugely anticipated festival promises some of the most exceptional pairings in the 4-day camping event’s already remarkable history. LOCKN’ takes place August 23-26 in Arrington, VA at Infinity Downs, LOCKN’s 387-acre property located at the foot of the Blue Ridge Mountains. Headlined by Dead & Company in a rare festival appearance, performing four sets over two nights in their final live shows of 2018, LOCKN’ will see Widespread Panic joined onstage by Margo Price (Friday, August 24); Toots & The Maytals will perform with special guest Taj Mahal (Friday, August 24); and Eric Krasno will sit in with Lettuce for their “Lettuce Celebrates JGB” set (Saturday, August 25). These unprecedented unions follow previously unveiled LOCKN’ 2018 collaborations that will include Branford Marsalis joining Dead & Company for their very last live set of 2018 (Sunday, August 26); a once-in-a-lifetime pairing of Umphrey’s McGee and Jason Bonham performing a set of Led Zeppelin classics (Friday, August 24); and Foundation of Funk celebrating 50 years of The Meters with George Porter Jr., Zigaboo Modeliste, Cyril Neville, Ivan Neville, Tony Hall, and others (Saturday, August 25). As if all that weren’t enough, LOCKN’ will also feature: Tedeschi Trucks Band (performing two separate days), Sheryl Crow, Joe Russo’s Almost Dead (performing on two separate days), George Clinton & P-Funk, Umphrey’s McGee (performing two separate days), Pigeons Playing Pingpong, Blues Traveler, Moon Taxi, Turkuaz, The Suffers, and more. The full schedule is below. For the first time ever, LOCKN’ is offering a Three-Day Weekend Pass in addition to its traditional Four-Day Festival Pass, allowing fans with tighter schedules to still see all the bands performing at LOCKN’ for a lower price. Single-Day Festival Passes are also available. Forest Camping and Tent-Only Camping are both completely sold out. A limited amount of Student/Military tickets are still available. For complete details and remaining ticket availability, please visit locknfestival.com/tickets. 2017 saw LOCKN’ introduce a new and improved festival layout at Infinity Downs Farm, with the central venue now encompassing both the main stage and Blue Ridge Bowl natural amphitheater, allowing more than 20,000 fans to enjoy non-stop music all weekend long with improved sight lines and easy access to all the incredible food, drinks, shopping, and social action activities. The new and improved venue location is more accessible to all campsites, with additional shade and misting stations to provide extra respite in the event of heat. The venue location and streamlined layout also allow for more efficient and direct traffic access, making entering and exiting LOCKN’ smoother than ever before. Dayglo and Silent Partner Presents are excited to unveil LOCKN’ festival’s remarkable 2019 lineup. This year’s edition of the four-day multi-stage camping festival features a number of extraordinary artist collaborations, once again affirming LOCKN’ as one of the world’s most exciting and unique summer gatherings. LOCKN’ takes place August 22-25 in Arrington, VA at Infinity Downs, LOCKN’s 387-acre property located at the foot of the Blue Ridge Mountains. Tickets will go on sale tomorrow, Saturday, February 16 at 12 Noon ET via LOCKNFESTIVAL.COM. LOCKN’ 2019 will showcase a truly amazing range of artists performing over the four-day event, with additional artists to be announced in the coming weeks. Thursday, August 22, will feature Joe Russo’s Almost Dead, Gary Clark Jr., Khruangbin, Chris Robinson Brotherhood, and Andy Frasco & The U.N.
Friday, August 23 will include headliners Trey Anastasio Band Feat. Derek Trucks alongside The Revivalists, Old Crow Medicine Show, Pigeons Playing Ping Pong, Edie Brickell & New Bohemians, Melvin Seals & JGB, Moonalice collaborating with The Chambers Brothers, and Greg Humphreys Electric Trio. Saturday, August 24, will see Anastasio returning the favor by joining Tedeschi Trucks Band during their headline set, topping a star-studded bill that also includes Vulfpeck, Oteil & Friends feat. Bob Weir with Devon Allman, Duane Betts & more, Twiddle, Preservation Hall Jazz Band, The Allman Betts Band, Cory Henry & The Funk Apostles, and Liz Cooper & The Stampede. Sunday, August 25th, will be headlined by Bob Weir and Wolf Bros Feat. Susan Tedeschi, along with Jason Isbell and The 400 Unit, moe., St. Paul & The Broken Bones, Steel Pulse, Nahko and Medicine For The People, The Soul Rebels, Deva Mahal, and Keller Williams’ Grateful Gospel. In addition, LOCKN’s beloved Garcia’s Forest will feature an array of early and late shows throughout the festival weekend, with performers including Fruition, The Lil Smokies, and Town Mountain (Early Shows) and Galactic, Soulive, and Circles Around The Sun (Late Shows). LOCKN’ is once again offering a Three-Day Weekend Pass in addition to its traditional Four-Day Festival Pass, allowing fans with tighter schedules to still see all the bands performing at LOCKN’ for a lower price. Single-Day Festival Passes are also available. For complete details, please visit locknfestival.com/tickets.